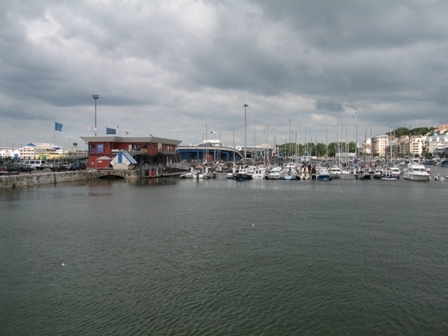 Our first port in France was Dunkerque. 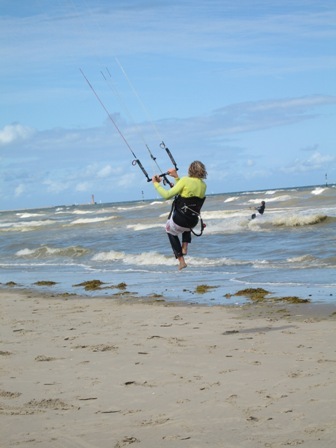 We were both very excited to reach France, where there was deeper water and no sandbars. 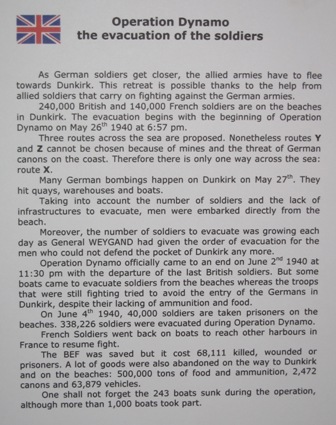 Marco brushed up on his High School French before we got to Dunkerque and I was very impressed. When we sailed up to the harbor it appeared large and industrial at its entrance, but had a nice marina reasonably close to town. 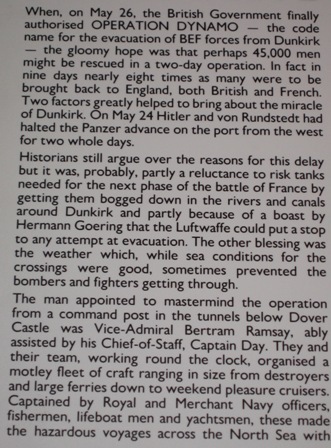 This area is probably best known for the evacuation of the British Expeditionary Force from its beaches in 1940. There is a fascinating museum near the marina, memorializing the events. Below are some excerpts of the museum. The architecture in the town is obviously fairly recent compared to some of the other European towns due to such large scale destruction during the war. 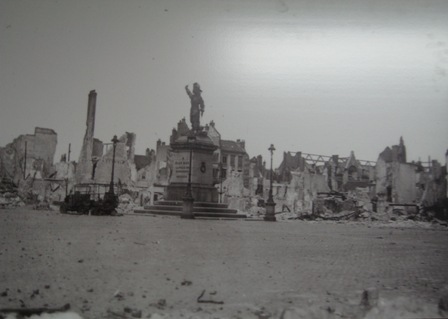 This is a picture of the major square in downtown Dunkerque after it was destroyed during the war. It was eerie walking by this monument after seeing this picture in the museum. 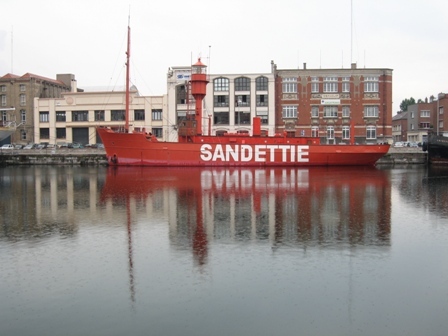 This is the original Sandettie lightship that kept vessels off the Sandettie Bank in the North Sea. It is the vessel where our friend's boat was named after. The original owner was saved by this boat years ago when lost at sea, and vowed to name his next boat after this beacon. It is currently a museum in the harbor of Dunkerque. 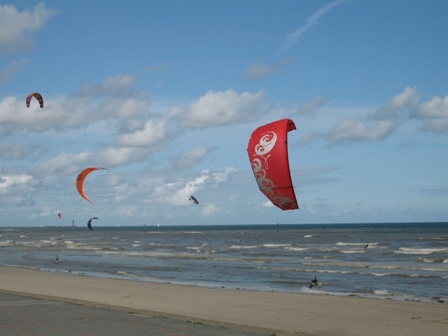 Kite surfing has really caught on here in Dunkerque. It is also the first beach we've been to since the Azores. It was a really beautiful beach and a walk-way that went on and on. Sheila Quigley, our next door neighbor in RI, gave me the idea to collect sand from every beach that we go to and display the samples is glass jars when we get home. I have started doing this from the beginning so now I have 2 samples of sand. Thanks Shelia for the great idea!!! One of the delights here has been to gather our meals at the market. 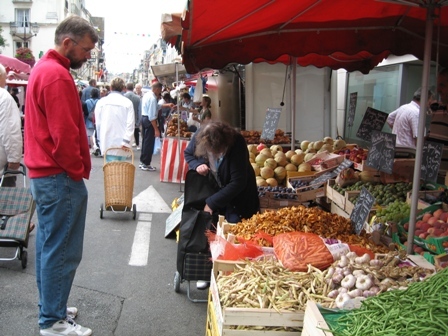 Every town has "market day" where you can get everything you need from fresh vegetables, cheese, meat, fish and household supplies. 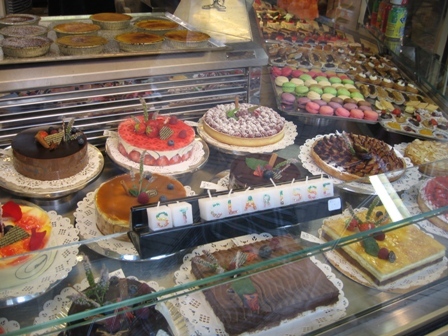 The tremendous variety of cheeses, breads, and other epicurean treats has made each meal an adventure. It turns out that mold doesn't mean that it has gone bad. 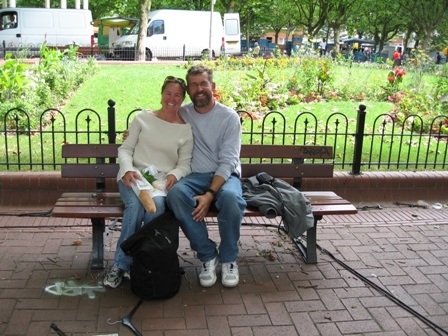 This picture is of Marco and I just after we gathered our lunch. Unfortunately we had stumbled onto the market just as it was closing, but we were still able to get amazing cheese, bread, fresh basil and a very nice gentleman gave us some delicious tomatoes. This was truly a feast for Kings. 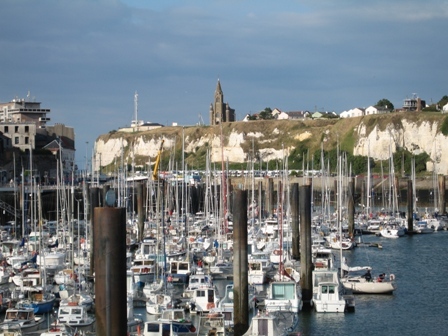 Boulogne is France's most active fishing port, and produces 25 percent of the national catch. In the morning, right next to the Marina the fisherman's wives would open their stalls and sell their husbands catch. The variety of fish was very impressive. 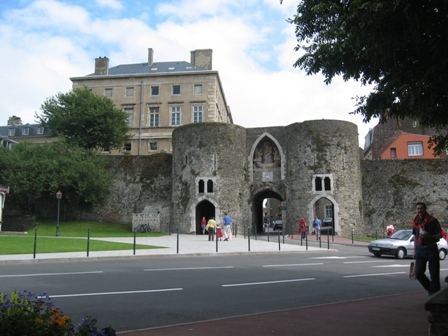 During the course of Boulogne's history it has been the site used often to prepare for an invasion of England, Bonaparte and Julius Caesar are two of the better known people to do just that. 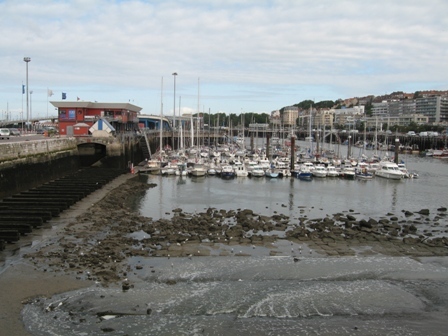 This is the marina at Boulogne at high and low tide. We are in awe at the changes in the water depth. Here it was about a 6 meter difference (almost 20 ft.) between low and high tide. As you can tell, we like to enter and leave a harbor at or near HW (high-water) near slack tide so that we are not also fighting the current which can run like a river. 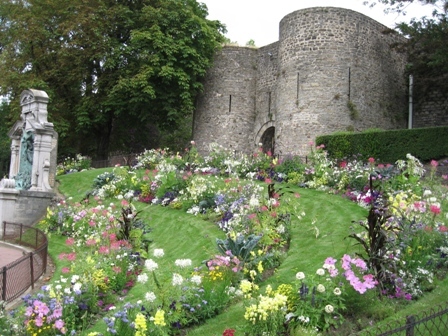 The old town of Boulogne, located on a hill, has a circumferential wall as well as a small associated castle dating from the 13th century that dominates the city. The prominent cathedral , Notre Dame, that you can see from anywhere in town was rebuilt in the 19th century after the original building was destroyed in the name of Liberty, Equality and Fraternity during the French Revolution . 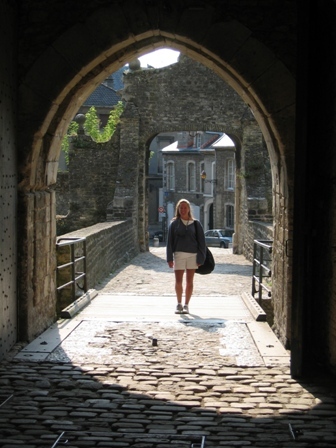 Here Holly is standing at Chateau-Musee which was completed in 1231 and was the first castle built without a keep. Pictures of the wall surrounding the medieval upper part of town. 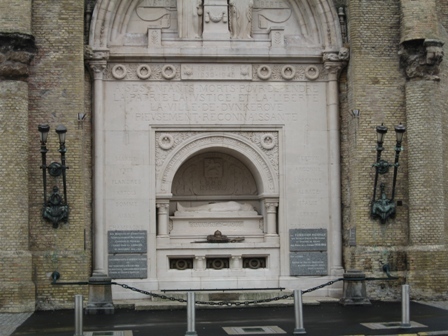 Over the centuries the British have had a strong interest in Dieppe. 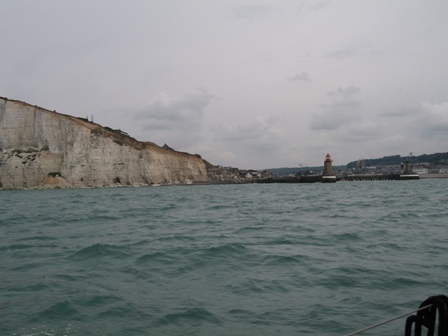 Henry II overtook Dieppe, along with much of northern France, during the 12th century. Then in 1694 a Dutch-British force flattened Dieppe in retaliation for the French pirates that were "working" the English Channel. Also many famous artists have come here to paint or write, like Whistler and Oscar Wilde. Nowadays everywhere you look are British "day-trippers" that have come across the Channel by fast ferries, to buy tax free wine. This is Port Jehan Ango, named after a 16th century Norman privateer or "ship-owner", depending who's facts you want to believe. We were moored right in the center of the city. As you can see the harbor is very full. Initially we were concerned that different harbors would not have room left but even when they say that the harbor is full they always make room for another boat. We have also become very spoiled so far on this trip being at a dock that has electricity and a fresh water supply every day. We just plug in the battery charger and we can run the microwave, the water heater for a shower and make ice cubes in the freezer without worrying about draining the batteries. Once we are in Spain we will be anchoring much more and ice cubes will only be a faint memory. The tidal range continues to impress us. The first picture shows Holly at the end of the dock at low tide, and the second at high tide. The depth varies by approximately 25 to 30 feet. It rained quite a bit while we were in Dieppe, but one day a week they have an absolutely amazing market. The market went on and on and there was everything there that you could imagine and more. We bought a freshly roasted chicken, artichokes larger than I had ever seen before and fresh made cider vinegar, from a women that moved from New Hampshire to France 15 years ago, and now owns a cider orchard. We also tried different sausages, many with thick mold on them, and of course fresh bread from the Boulangerie (bakery). 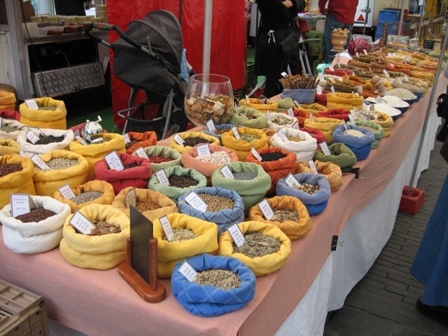 A display of different herbs at the market. Oh, what should we get for our dessert? So many choices!!!! 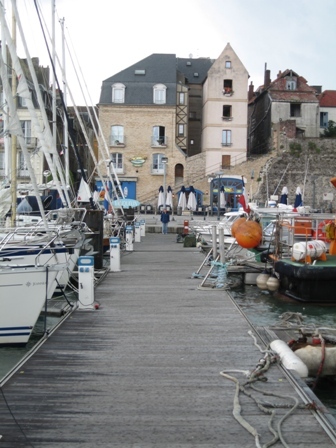 Fécamp is the home of a major fleet of deep-sea trawlers, where they fish for cod (now declining), and is also famous for being the place where Bénédictine liqueur is made. It's other claim to fame is that it is said that a casket that contained drop's of Christ's blood washed ashore in the first century and thus made it a pilgrimage center. 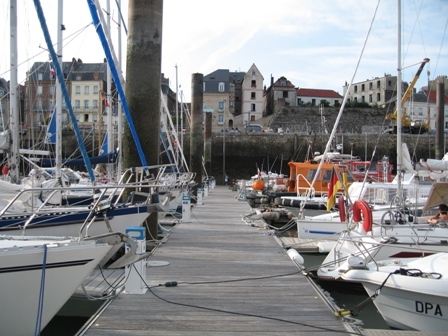 Here we are entering the harbor of Fécamp. The Pilot books have been extremely helpful by describing the entrances of different harbors, hazards to look out for, tide states where it is safe to enter, etc... Initially we would both get a little stressed when we would enter a new harbor but now we have a routine down where I get both sides of the boat ready with the lines and fenders so that there is nothing to have to prepare when we find a slip to pull into. In Europe, they use the A buoyage IALA System and "Red Right Returning" does not work here. The red nuns are on the port side of the boat and the green cans should remain on the starboard side for safe navigation when entering a harbor. 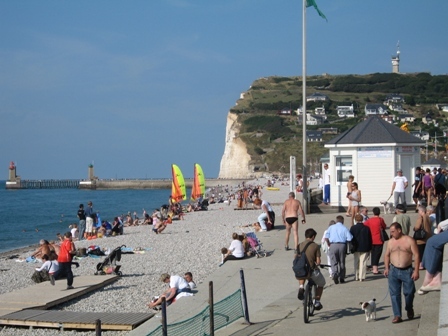 This is the beach in Fécamp. There are always a lot of people around during the day and the night. The marina was located to the right of this picture. You can also see the entrance to the harbor in the top left of the picture. One evening they had advertised that there was going to be a live band on the beach, so Marco and I went up to listen. 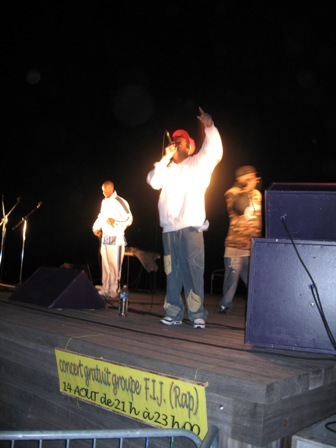 Unfortunately, the "band" turned out to be a group of French rappers. Marco and I like all types of music but this performance was truly awful! It was so bad that the crowd ended up migrating down the beach to watch a group of girls aged between 5 and 18 do a routine with lighted batons to music. 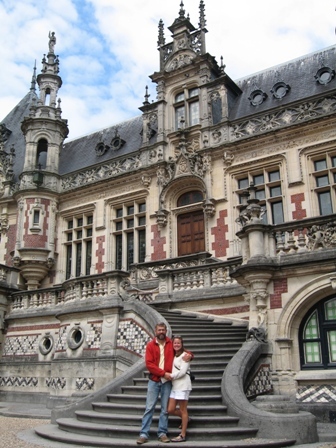 This is the Palais Bénédictine, an example of Gothic-Renaissance architecture. 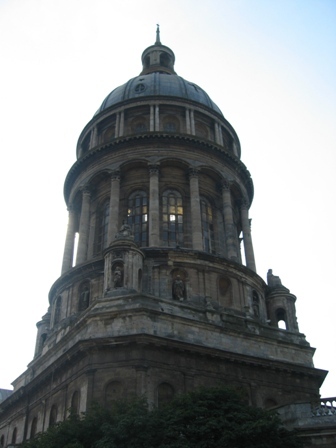 It was designed by Camille Albert, the Fécamp town architect. 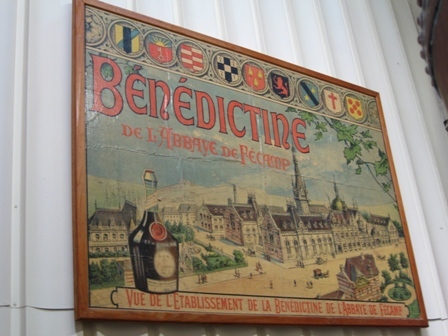 This is also where, since 1900, Bénédictine liqueur has been produced. 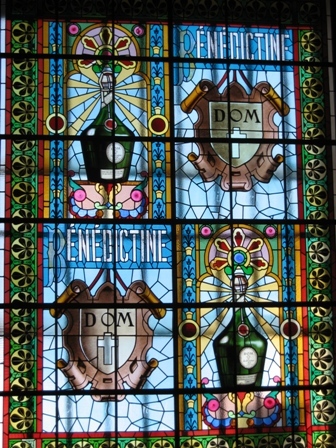 Bénédictine liqueur was invented during the Renaissance, in 1510, by a Benedictine monk from the abbey in Fécamp, Dom Bernardo Vincelli. He was in charge of the abbey's pharmacy and he created the health elixir to cure all sorts of aliments. This elixir was used by the monks until the French Revolution. It wasn't until the 19th century, where a wine trader, Alexandre Le Grand, rediscovered the recipe for the elixir and using his rudimentary still, after many attempts created Bénédictine liqueur. Although the Bénédictine recipe is secret, they did tell us during the tour that it is made up of twenty-seven different plants and spices. Angelica, hyssop and melissa are the three essential ingredients, but cinnamon, saffron, as well as thyme and vanilla also contribute to the mixture. Alexandre Le Grand was truly a man before his time. Today the use of communication is unavoidable and necessary, but in the middle of the 19th century, advertising was considered superfluous. Alexandre Le Grand, however, began an intense campaign to advertise Bénédictine liqueur. With the help of the greatest poster painters of the 19th century, like Sem, Lopes Silva, Cappiello and Mucha, he distributed posters worldwide to market Bénédictine. He also protected himself with patents against counterfeits by making the bottle a distinct shape, and he protected the label and the seal by marking them with the three letters D.O.M.., the motto of the Benedictine order: Deo Optimo Maximo (to God the great, the very good). 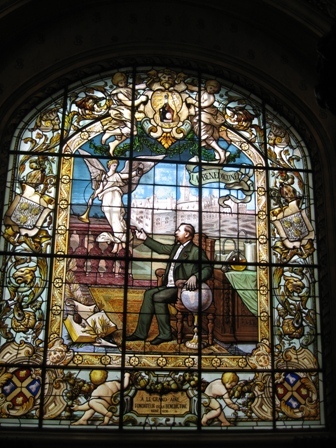 These stained glass windows were made in 1900 in memory of Alexandre Le Grand (1830-1898). They depict him committing the Benedictine bottle to Fame (i.e. conjuring up advertising). He has one hand on the globe (redolent of export). The palace and the bottle that dominate the picture are there to show the founder's concern for protecting his trade mark. Marco, checking to see if it is done yet. This is the distillery. 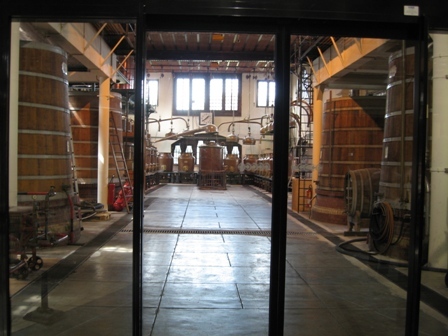 After the plants are prepared they are brought into this room where they are infused with a mixture of lemon peel and vanilla which is performed in the copper casks straight ahead. This step gives the liqueur its amber color. The concoction is then distilled twice in copper stills. The spirits are then allowed to mature for 3 months in the cellars. 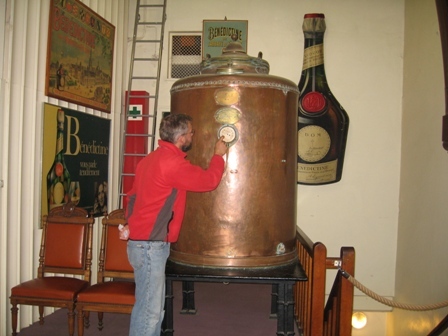 After this time, the spirits are then blended which produces the core of the liqueur. It is again matured in oak casks for 1 year, then dissolved in a mixture of alcohol, water, syrup and an infusion of saffron, honey and caramel. It is then finally heated to 55°C and finally filtered. After the tour you are allowed to sample some of the product. 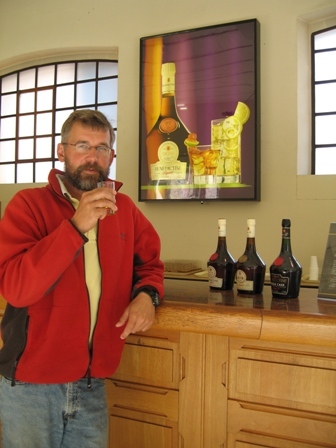 There are 3 types of liqueur made here, Benedictine, B&B (Benedictine and Brandy) which is mostly exported to North America and Benedictine Single Cask.